This grilled cheese is so simple, but so so so so so delicious! Because BBQ sauce and white cheddar go together like peanut butter and jelly. Or chocolate and mint. Or salt and caramel. Or ham and cheese. Or burger and fries. Butter the outsides of the bread. Mayo on the insides. Get the chicken nice and shredded, you don’t want any large clumps causing problems. 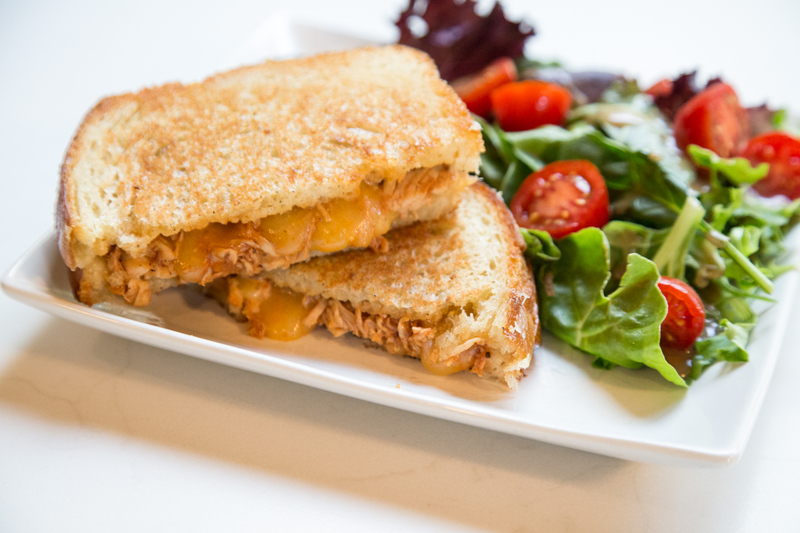 Use shredded sharp cheddar…the shredded cheese works better with shredded chicken and melts better into all the corners and crevices inside the sandwich. Preheat the skillet or electric griddle over medium high heat. Spray with nonstick cooking spray, or melt some butter onto the grilling surface. Butter the outsides of the bread, and spread mayo on the insides of the bread. Assemble sandwiches with shredded chicken, shredded white cheddar and shredded mild cheddar. Grill until golden on both sides, flipping carefully, about 1-2 minutes per side. Repeat until all sandwiches are grilled. Serve BBQ Chicken White Cheddar Grilled Cheese with simple side salad.